We promised that we would reweave the Bifrost Starmap synergy wraps, and here is the form for you to tell us how much to weave! We are offering the chance to pre-order on trust. This means that we will weave a wrap for you without expecting you to pay anything upfront. 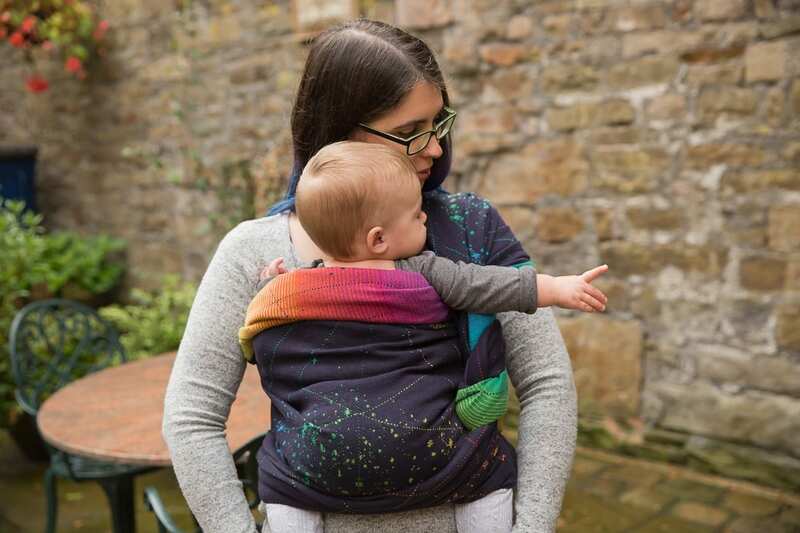 We do need you to be as sure as you can that you want to go ahead and buy whatever you’ve ordered when it finally arrives (which could be a good few months away as the whole wrap weaving and sewing process is very long). We’re too small a company to be left with lots of unpaid orders, and it will impact on our ability to make other lovely things for you! So if you know what you want to order, and are okay with the very vague timescale, then use this form to let us know exactly what you want and we’ll make sure to have enough cloth woven to guarantee you’ll get your wrap, bag, scarf etc. The preorder is now closed. Some guidance for filling in the form! There are two different designs available, starmap and seafoam. Both will be 100% combed cotton, synergy weave in the bifrost twilight colours. Make sure to select the right one! This form is just to help us calculate how much cloth to weave. You don’t need to tell us any details (which cloth side out you’d like a bag making, what shoulder you’d want for a ringsling etc). All the details will be sorted when you pay the invoice for the item. Waiting for preorders can feel like an eternity! We will be in contact when we have any definite dates, so if you haven’t heard from us then it’ll be because we don’t know anything useful to tell you- just sit tight and read some reviews to keep you busy! We’ll send you a link to purchase your item once the cloth is ready. You will have 5 weeks from that point in which to settle the balance. If you are worried about keeping funds available, you can always purchase firespiral gift vouchers now and use them to pay with once your item is ready. If you decide that you don’t want to go ahead with the order that you make, please inform us as soon as possible. In the unlikely event of us being unable to fulfil all orders due to an issue outside of our control, we will process orders chronologically using what cloth we have available. As a small company we can’t have a contingency for every situation, we can’t guarantee timescales or offer compensation/alternatives for unfulfilled /delayed orders.